Confession: I am not fond of knitting socks on DPNs. I love socks! Love socks. I love the portability, the almost- instant gratification, the swiftness of sock knitting, but oh, how I dislike small gauge DPN work. I’m comfortable with double- pointed needles; I just don’t like dealing with many many pointy ends while trying to keep track of many many teensy stitches. 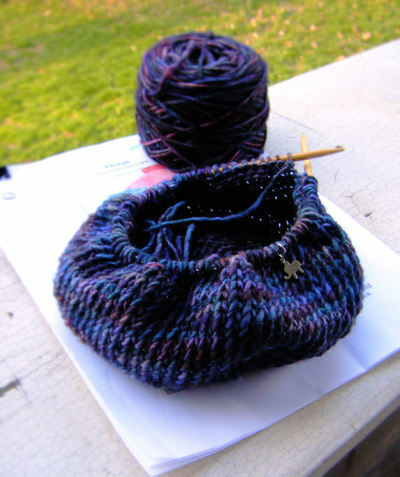 I tried Magic Loop for a week or two, but it just pisses me right off, so I’d resigned myself to DPNs, forging onward in the hopes of somehow learning to love knitting socks on them. I was watching some of Cat Bordhi’s YouTube videos, though- I have one of her books on sock knitting. I found her two part tutorial on knitting on two circular needles, and finally- finally!- it clicked. I’d read her explanation of the technique in Socks Soar On Two Circular Needles, but it hadn’t worked out for me- apparently I learn techniques by seeing, then doing, not through reading, then screwing it up 4852 times. The first video was really all I needed, I think, but part two totally nailed it. I can’t see going back to socks on DPNs ever again. Speaking of socks, there was a sock misadventure recently, resulting in massive frogging. I’d knit through the length of the leg, turned the heel (ha ha, originally typo’ed as "turned the hell" there), picked up stitches, and gotten halfway through the foot before I realized my error. This, folks, is why I shouldn’t pick up stitches at Happy Hour. This is not, I repeat, not an example of Drunken Knitting, I swear! I’d only had a beer that night. This here is an example of Distracted Knitting, which is probably just as bad. Worst of all, the other side is completely perfect. So it’s frogged. 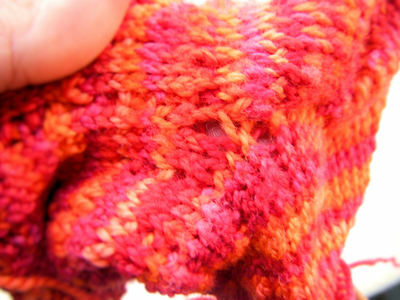 Which is all right, I suppose; I wanted to do the second sock using the two circs method. Bright side to this is, I get to do them both that way now, right? In the wake of the Sock Catastrophe, I cast on for Thorpe. (Web link, Ravelry link.) What can I say? I needed a quick lift. This is it, too- it’s knitting up superfast in handpaintedyarn.com‘s Colonia 140. Plus it’s stash knitting! Some of my first order of the Amatista colorway. 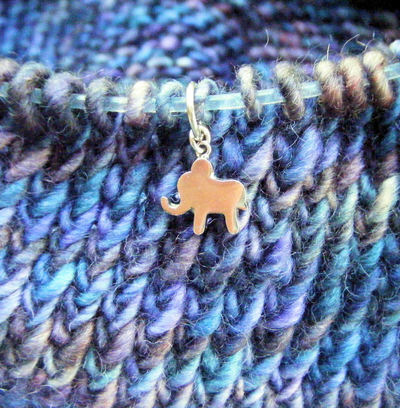 Also, I don’t know if you noticed, but the elephant stitch markers make me happy. Hooray, tiny elephants! They came from Pookeh’s Etsy shop. Mr. Greenjeans is coming along, still, but more slowly- obviously. My WIP fidelity issues slow everything down. I always did have a fear of commitment. In other news, the new Great Yarn Giveaway goes up tomorrow afternoon- something from the stash, this time. I’m thinking of doing a few grab boxes, actually- anyone have thoughts/ feelings/ input on that? ← in which we congratulate Joanna! I abhor the DPN’s. The laddering, the points everywhere, I can never make it work right. I am all about the magic loop so quick and easy. 🙂 I do want to try the two circs though I think that looks really easy too.